“I think music has a natural tendency—or any sort of creative thing—to evolve, and although I guess in the digital world, you can just press play and things will sound exactly the same, I don’t think that’s very interesting to people. 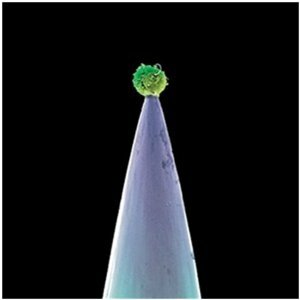 I think it’s more interesting when it does change and can go wrong.” – Peter Gabriel, from our Paste interview. Musicians are a peculiar, finicky type—always trying to box themselves in, always reacting (often in complete opposition) against the last artistic move they just made. And there’s no better example than Peter Gabriel, one of pop music’s most innovative and, sadly, underrated chameleons. Even at his most commercially omnipresent (Hits, like “Sledgehammer” and “Big Time,” positively sprouted from his 1986 pop landmark, So), Gabriel’s never been one for spoon-feeding his euphoria. He’s never made the same musical move twice—compare the stark, processed synth-scapes of 1982’s Security with the slick, radio-friendly art-pop of So, and it’s difficult (particularly for a casual fan) to hear the artistic parallels. With great art comes great risk, and Gabriel has based his career around that notion. With New Blood, a sequel of sorts to his 2010 orchestral song-swap project, Scratch My Back, Gabriel once again works with arranger John Metcalfe, utilizing only the colors and textures of a large-scale orchestra without the aid of guitars, synthesizers, or a traditional rhythm section. After the release of Scratch My Back, with international tour dates looming in the distance, Gabriel realized he needed more music to flesh out a full-length concert, so he took the logical next step—peering into the deep expanses of his discography and seeing what tracks would translate well to an orchestral setting, consciously avoiding his biggest hits along the way. No, there is no “Sledgehammer” here. No “Games Without Frontiers.” No “Shock the Monkey” (although I would pay serious money to hear that one). New Blood is crafted as, you know, a legitimate full-length album—one where the pieces are designed to hang together, with stand-outs and singles set aside in favor of musical and thematic unity. Despite the fact that we’ve all heard these songs before, Gabriel and Metcalfe have achieved nothing short of a miracle reinvention: Nothing feels even remotely stale, and many of these tracks manage to actually improve upon their original counterparts—no small feat, considering the fact that these are some of the finest songs ever written. Gabriel’s in excellent voice throughout, sweeping majestically to his sweet-spot falsetto without blinking an eye, balanced out by the gravelly bass range he’s nuanced over his past few studio albums. His daughter Melanie, now a long-standing live vocal harmonizer, brings her gentle, Kate Bush-ish presence to a number of tracks, nailing her duet with daddy in the now vastly improved “Downside Up” and elsewhere adding lovely, unobtrusive texture. But for every reassuring comfort, there’s a risky, rewarding reinterpretation. Norwegian songwriter Ane Brun—who, along with Melanie, added backing vocals at Gabriel’s recent New Blood shows—takes a vocal spotlight on “Don’t Give Up,” duetting with Gabriel on the once gospel-tinged belter. The original So version featured the airy, alien Kate Bush playing the female role (cemented even further the pop music time capsule with a cheesy/romantic music video featuring Gabriel and Bush holding hands and staring wide-eyed at one another). For diehards, Bush’s role is a void no vocalist has been able to properly fill (though Paula Cole sure did her damnedest during the early ‘90s Us tour), and Brun’s interpretation, with its rapid-fire vibrato and unusual phrasing, promises to rub many fans the wrong way. Give it a few spins, though, and Brun’s polarizing rendition slowly starts to make sense. Another of Gabriel’s bold stances happens in the previously funky “Digging in the Dirt,” which is now minimal and drained of its exotic strut. Most shocking is the chorus, which now features fewer dramatic chord changes and a simplified melody that never feels half as cathartic. It’s the only musical change that somehow feels like a compromise. Everything else is sublime, the colors of the orchestra heightening every emotion. The original Security version of “The Rhythm of the Heat” climaxes in a flame of circling African percussion; this New Blood take translates the rhythms over to string instruments, sawing and sweating toward a chaos of blinding testosterone. “San Jacinto” (another Security stunner) was formerly a quiet revelation that never fully exploded, even when it peaked in a whirlwind of synthesized strings and electronic drums. Here, that emotion so gloriously teased is brought swimming, transcendently, to the surface. “I hold the light!” Gabriel erupts amid a hypnotic symphonic flood of pizzacatto strings and fluttering flutes. Three decades have passed, yet you’re hearing it for the very first time.